Americans have sought out the company of like-minded souls since the Pilgrims landed at Plymouth, organizing around religion, politics, and philosophy. What we refer to today as intentional communities have their roots in 19th- and early 20th-century communes and utopian societies such as the Shakers and the transcendentalist utopian experiment at Brook Farm in West Roxbury, Massachusetts that inspired such writers as Thoreau and Nathaniel Hawthorne. These early societies were based largely on ethical and spiritual or religious principles and not food, agriculture or "green" principles. Shared communities today, frequently called intentional communities, often form around the issue of sustainability. They are also largely vegetarian, because of the growing realization that the ecological price of meat is too high. Intentional communities today encompass a wide variety of alternative living arrangements from the highly unusual to more conservative mainstream arrangements. These include ecovillages and cohousing which, like the early utopian communities, are alternative societies of various types that basically consist of a group of people who have chosen to live or work together in pursuit of a common goal or vision. The underlying vision of sustainability is defined by the U.S. Environmental Protection Agency as "meeting the needs of the present without compromising the ability of future generations to meet their own needs." For example, "sustainable agriculture" strives to develop agricultural systems that will last indefinitely. In ecovillages, for example, members strive to integrate a supportive social environment with a way of life that aims for a minimum adverse impact on the environment. These communities integrate various aspects of ecological design and permaculture, such as natural and non-toxic buildings, organic gardening and composting, preservation of wilderness, biological waste management, reuse, recycle and rebuilding, renewable power systems, and conservation land planning. The Global Ecovillage Network lists 379 such groups. 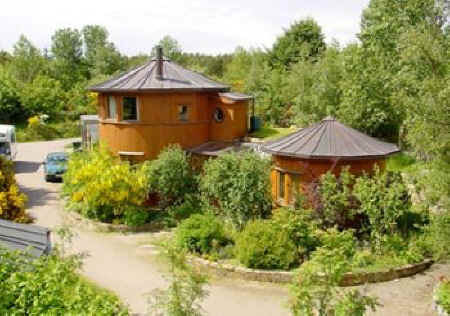 One of the best-known is EcoVillage at Ithaca, New York (EVI), founded in 1991. EVI includes two 30-home cohousing neighborhoods with another in the planning stages, an organic CSA (Community Sponsored Agriculture) vegetable farm, an organic berry farm, office spaces for cottage industry, a neighborhood root cellar, and community gardens. Over 80 percent of the 175 acre site is planned to retain green space, including 55 acres in a conservation easement. About 21 to 50 percent of the vegetables and fruits are grown onsite. Dietary choices are up to the individuals but are primarily vegetarian. Under consideration are on-site biological wastewater treatment, gray water recycling, biomass energy crops, onsite biodiesel/vegetable-oil fuel production, and a natural cemetery. Cohousing groups are generally more diverse and less specific. Each family or individual owns their own home but some facilities and resources are shared—for example a dining area, playroom, or vegetable garden. There are several co-housing communities in various stages of development in the Hudson Valley, such as Ulster County's Legacy Farm Cohousing in Rosendale. Concern about so-called "green issues" among intentional communities can probably be traced to 1971, when a group of young "hippies," mostly college students of instructor Stephen Gaskin at the Experimental College at San Francisco State University, followed his lead to start the first experiment in sustainability in modern times by forming a communal living arrangement in the hills of Tennessee near Nashville. Called The Farm, this community of vegetarians lived simply in modest but comfortable homes, some working part-time to raise money to tend their organic gardens, volunteer for charities and cook meals from scratch. They started a soy dairy that churned out thousands of pounds of tofu and gallons of soymilk, and in 1974 they pioneered the US production of tempeh—a fermented soy product high in vitamin B12. In 1973 The Farm officially became an ecovillage. The Farm has thrived for many years, and today their Ecovillage Training Center provides organic farming apprenticeships and gives courses in growing mushrooms, installing solar panels, and other agricultural, health, and environmental issues. In 1985 another model shared community was formed in Scotland, called Findhorn. It is now the UK's oldest and largest CSA, with 55 ecologically benign buildings, solar heating, four wind turbines, and a host of educational workshops open to the public. Most Ecovillages consider "permaculture"—the philosophy of designing human living spaces around environmental principles—as a core principle. For example, homes are meant to resemble natural ecosystems in their efficiency, productivity, health and beauty; farming and landscaping are also eco-friendly. Local resident Priscilla Agnello of Pine Plains says that she learned permaculture from her mother, who studied environmental education at NYU. Priscilla will be taking a month long vacation this summer where she will be teaching Permaculture at a farm in Wisconsin. Priscilla recommends visiting the website www.woofing.com if you want to find an inexpensive ecovillage or other organic sustainable farm where, like her, you can sign up for a work exchange program where you may receive free room and board and perhaps a small stipend. Of course, most of the growing number of Americans in the Hudson Valley and elsewhere who are striving to live as "sustainable" a lifestyle as possible are not yet ready to move into an intentional community. Take for example Milan residents Judi Gelardi, her husband Gib Hague, and their son Michael. They, too, are on a mission. "We only use organic foods and whole ingredients." Like me, they belong to Sisters Hill Farm in Stanfordville, an organic CSA for which members pay a flat fee at the start of the growing season and pick up their bountiful share of elegant and diverse organic, locally-grown produce from May through early November. This simple act brings healthful plant food to the table that is grown without the use of conventional pesticides, petroleum-based fertilizers, or sewage sludge. Buying local foods also avoids the high eco-cost of fuels to truck or fly produce to the supermarket, and fuels the new "locavore" movement. Judi's family helps the environment in other ways too. "We car pool and recycle, for one thing." But, she emphasized, "by far the best thing we do for the planet is to be vegetarian." In fact, Michael, age 17, has been vegetarian since birth. In 2001, Judi graduated to the "highest" form of vegetarian, called veganism. Vegans, or "total" vegetarians, do not eat milk, cheese, or other dairy products, eggs or use any other animal products , including wearing leather. I too am vegan, and have been for about 20 years. And for more than 20 years prior to that, I was vegetarian. How does vegetarianism contribute to sustainability? Consider the following conclusions of the recent United Nations report on "Livestock's Long Shadow": Livestock production is one of the top two or three most significant contributors to every serious environmental problem in our world today. Seventy percent of all agricultural land in the world and 30 percent of the land surface of the earth is used for livestock production, which itself generates nearly one fifth of the world's greenhouse gas emissions, mostly methane. Eight percent of the worldwide consumption of water is used for the irrigation of feed crops. Livestock production is a significant contributor to the growing lack of water; in many parts of the world clean drinking water is no longer available. In the US alone, livestock and feed crop agriculture are responsible for the use of 37 percent of pesticides, 50 percent of antibiotics, 33 percent of all nitrogen and phosphorus found in freshwater resources, and 66 percent of all ammonia, a significant contributor to the acidification of ecosystems. Livestock production is also one of the main causes for the extinction of species. It takes about two to five times more grain to produce the same amount of calories from livestock as those contained in grain consumed directly. Meanwhile, Americans eat about eight ounces of meat daily, roughly twice the global average. Many people, particularly in the so-called Third World countries, no longer find land to grow their own crops. As a result, about 800 million people worldwide suffer from hunger or malnutrition, while most of corn and soy grown feed cattle, pigs and chickens. According to Christopher Flavin of the Worldwatch Institute, "The choice to become a vegetarian or to lower meat consumption is one of the most positive lifestyle changes a person could make in terms of reducing one's personal impact on the environment." Two geophysicists in a January article in the New York Times calculated that "if Americans were to reduce meat consumption by just 20 percent it would be as if we all switched from a standard sedan—a Camry, say—to the ultra-efficient Prius." The article also refers to a study conducted by the National Institute of Livestock and Grassland Science in Japan which estimated that 2.2 pounds of beef "burns enough energy to light a 100-watt bulb for nearly 20 days." Although being a vegetarian or vegan is an individual choice, it is hardly a lonely one. Judi, Gib, Michael, and I are also proud members of the Mid-Hudson Vegetarian Society which is based in Rhinebeck, but has 100 or more members spread throughout the area, and as far as New York City, New Jersey, and the North Country. MHVS's goal is to inform, educate and otherwise help individuals who are, or are considering becoming, vegetarian or vegan. The group also hosts potluck dinners and educational events, one of which is the yearly Thanksgiving dinner which gives thanks without sacrificing a turkey. Website administrator and MHVS member Frank L. Hoffman, who hosts the popular website www.all-creatures.org says," Turkeys are blessed, 'cause we treat them as guests." Although MHVS members and other vegetarians may make their dietary choices for reasons other than environmental ones—better health or animal welfare, for example—we are largely united in our quest to reduce our environmental footprint and achieve a more sustainable lifestyle.